Andrew Powell MP, Minister for Environment and Heritage Protection. I have received a few offers from people to donate towards the fine I received. Donations can be made at your local Magistrates court. Payee is ‘State Penalties Enforcement Registry’ and my Party ID is: 62883053. Please be sure to get a receipt, and if you would be so kind as to post me a copy of the receipt for my records, I would be most grateful. Oh my I am from the USA and we dont have any starving native animals, we have park rangers that know how to manage populations. This was a sad sight to witness, I went to Australia to have fun and see a nice landscape. One of my last stops was Fraser Island, I would never recommend this sad sight. It broke my heart too see these forgotten creatures starving to death. Even the third world doesnt have dogs this skinny. It left me saddened, and I hope someone helps them. I would not recommend this place to anyone. God help them. I would like to discuss ways of assisting you but cannot find an email address on your site. Can you provide me with an address please. I cannot believe the dingo is not protected but instead is left to die of starvation on Fraser Island. This saddens me greatly. Australian can’t even protect our own animals but instead are letting this icon become extinct before our eyes. I had always thought Australia was a humane country, however, with my love of all animals I am finding out that Australia is a very inhumane country. Please please stop this disgusting treatment. Does the Qld Govt have no compassion to let this continue? My opinion of the Queensland Government regarding the native dogs on Fraser Island is disgust.Starving dogs to death is just the lowest of the lowest in the land of plenty. Arial drop food weekly has anyone thought of this simple solution and restrict the human beings (if not totally) to the beautiful island.Show some compassion, think of your own pet what would be your reaction to starve them? Dingoes should have the priority on Fraser Island, not tourist dollars. This is the bottom line. Wildlife are doing it tough always, and are seen as optional extras rather than integral on our land and part of our responsibility. The priorities are all about economic, not natural values. Dingoes must be protected, not loathed and lethally “managed” and starved. In answer to your question; Would this slow death sentence be because their usual target species/food sources have been removed to make the island more human/tourism business friendly? in a way: Yes. They have been fenced out of areas; hazed off the beach; disallowed from middens; hazed away from people; even the Butchulla People, the traditional owners of K’Gari, are no longer allowed to feed this, their companion dog. the ecosystem is shattered due to all the interference. The list goes on. Long history of companionship with people is the biggest problem; authorities want them to now be separate and ‘wild’, when they never were fully wild. they always depended on us in some way. But now, tourism rules, I am sad to say. I recently lost a pure north west desert dingo to a neighbours bullet. Although ‘Ernie’ was what I would call a very ‘socialized’ and friendly Dingo…, he/they always have that ‘call of the wild’ within them…, it can’t be ‘trained out’ of them…, and so one day back in January he escaped, went for a wander and my neighbour did not hesitate to shoot him. Of course I was devastated. So…, when I viewed the ABC’s Australian Story it brought it all back for me, it really resonated with me. These animals are too unique and special to allow to starve to death in what amounts to a concentration camp. It’s a national disgrace…, the Queensland Government are responsible for these animals for ‘the whole of Australia’, they are in effect the custodians of the last ‘manageable’ pure strain of dingo. I wish they would take this responsibility much more seriously. Question; Would this slow death sentence be because their usual target species/food sources have been removed to make the island more human/tourism business friendly ? Well it is hard to believe that that Jennifer parkhurst was fined 40,000 dollars for her natural caring for the dingoes, where is the RSPCA in all this? As far as I”m concerned the government has a lot to answer for. I just couldn’t believe it when I saw Australian story. how could anyone not feed the dingoes and how could one watch them dying without trying to help. SHAME SHAME SHAME to the powers that be. Its funny we send money over seas to save Bears…or try stop whaleing but dont do anything for our Dingos…stop feeding terrorist and look after our wild life. thanks for bringing up the very special fac that the dingo is on our Australian Passport! i dont think many people know that! And you’re right. if there are no dingoes left on FI it might be a lot easier to manage – but that’s becasue there wont be any people on the island either! no tourists, anyway. You are right. there was no justice in this anywhere. it was all about politics, and the welfare of the animals be damned – law be damned. Randall walked away scott free. The worst thing i have ever endured in my life was watching those animals suffer and die year after year. i amstill grieving. every now and then i suddenly get a flashback or memory and it’s as though it happened yesterday. thanks for understanding. I truly respect and admire your passion and determination to make a change to the future of the Australian Dingo Dogs. I was so affected watching these creatures die such a terrible and agonising death and will support you and this cause to the end. Thanks to you and Australian Story for making this documentary together we CAN and MUST make a CHANGE. This is so cruel, disgusting, callous & UN-AUSTRALIAN!!!! “family”. Just because the dingo is NOT in our backyards – does not mean we can destroy them!!! seeing a dingo in the wild…………even at a safe distance!!!! if you would like to help, please contact SFID and join (mkrail@bigpond.net.au). we can then get to know you and work out exactly what you can do, and you will recieve regular updates and newsletters. also, write to your local MP and demand that this matter is brought up in Parliament. the Govt needs to know that the citizens of this country care! thank you. Have an ‘enter at own risk’ policy. Alert people that this is a place where wild animals exist and make them understand that they would not leave their kids unsupervised at a billabong in Kakadu. – this is not done in other national parks. Relocate ‘animals to be culled’ to the many sanctuaries that are asking for pure FI dingoes. Educate people by using videos such as the one we saw on the AS program,, where a man thinks he is being attacked and panics. I tell him to stand still, which he immediately does, and the dingoes instantly walk away. NEW EDUCATION BROCHURES WHICH SFID WILL DISTRIBUTE TO LOCAL BACKPACKERS ETC, WE JUST NEED FUNDING TO PRINT THEM. Introduce random food drops During peak dingo breeding times, as is done by other national parks around the world, when the food supply is scarce. Starvation in animals is caused by human intrusion and needs to be fixed by human intervention. Accept that the beach is a dingoes’ territorial boundary and that it must patrol this boundary, and look for food there, every day. Post a ranger at busy tourist spots during peak times so that if a dingo approaches, they do not panic. introduce some captive-bred dingoes to a fenced display area of the island so tourists can have their photos taken with a dingo, and are less inclined to chase dingoes around trying to get a photo. Stop sensationalized reporting of dingo incidents. Save our dingoes or we’ll lose them. Start up a feed program to help these beautiful creatures, not condemn them. Shame on you government and the courts. Can’t you see how genuine Jennifer was and it’s human nature to not see anything suffer so I don’t blame her one bit. CHANGE THE LAWS NOW!!!!!! I just watched Australian Story and as a result came here. I’ve browsed through the site a bit but cannot find a part of the site where one can read what you believe to be the ‘right management plan’. would be good if there were one that i could read. sure – i’ve done a bit of reading between the lines ……..and maybe there is such a place on this site. if there is please point me there. Carolyn, i couldnt agree with you more. Dingoes have been on Fraser since the pyramids were built. Then in a few short years white fella comes along and manages it to death. if the dingoes disappear the ecosystem on the island will be completely ruined, which will cause a trophic cascade; the rainforest will be overtaken by weeds, the sand dunes will erode away and the only wildlife will be snakes, goannas and spiders. it will be left just an ugly sand blow with a tourist resort sitting on top of it. then what will it be worth? Hi Jennifer. I too was truly saddened by the images of these starving dingoes. If I were to have a dog in my back yard in this condition, I would be charged. If I were to CONTINUE to do so, I would be jailed. And yet, these people get away with it. It is criminal, and I agree as to why your fine was so high. That is also criminal. The dingo was there first. The only reason they do not want to stand on the side of the dingo is money. Tourism and money. We all know that. Good luck in your future ventures. I dont know what else to say. Its great fun wandering around on the brumby trails here, watching the way they make their way through the bush without breaking a twig! It’s amazing! And the dingoes and brumbies live symbiotically. The dingoes use the brumby trails, and den their pups next to the brumby trails. Let’s face it, brumby manure is rich enough in nutrients to feed a starving dingo, as is human excrement. So it makes sense. And the dingoes and aborigines on the island had a symbiotic relationship For that matter, most of nature does except for white fella. The Butchulla people themselves have stated: ‘the government tried to get rid of us, and now they are trying to get rid of our dog’. It would be no surprise if a child was killed by snake, crocodile, funnel web, drowning, dehydration, etc, if left alone in any of Australia’s national parks. I worked in Sri Lanka a few years back and remember VERY clearly the starving dogs, some in shocking condition, suffering dreadfully – a very slow and cruel death. I saw the same thing last night on television and sat ashamed, upset and angry that this could happen in Australia – what is going on? Where is the RSPCA? No wonder there are attacks on people when the dogs are starving…it’s not rocket science! It seems the intention is to starve and cull the dogs out of existence so tourists can enjoy the island – this is unacceptable. We need to urgently set up feeding stations on the island until a review is completed – perhaps introducing a new food source for the dogs. to get involved here – we do not treat animals in this way in Australia. We all have a responsibility to do something about this NOW. Two of my fondest childhood memories were, seeing a brumbie family with young foal casually walking up the Fraser Is breach with long wild mains and tails, and also seeing native dingos roaming free. I understand the brumbies were introduced and rightfully removed, but as this is the dingos native habitat humans have no right exterminating them to extinction. With regards to the footage shown on last nights “Australian Story”, of the young girl eating a packet of chips in front of a starving dingo, no wonder she got a nip. And it was only a nip! Wild animals have great instincts but unfortunately they can’t detect stupidity in humans! I don’t know the full details of the kid that was killed by dingos, but should we be surprised or shocked? Did the kid do anything to provoke an attack? Or is this even any different to a snake or jelly fish bite? Australia is full of critters that can kill you – that’s what makes Australia – AUSTRALIA. Get over it! Why is there no dingo sanctuary on Fraser Is? Instead of plenty of red-neck Rangers eager to shoot something! I am disgusted as to the treatment of one of our iconic native animals – but from retarded politicians I expect no better. This method was successful with the Tasmanian Tiger, and the Aboriginals to some degree…why stop hey? Having just watched your story on on ABC TV’s Australian Story tonight, I have to say I was deeply saddened seeing the pictures of starving dingos on Fraser Island and angered by the miscarriage of justice and punitive fines and sentencing you were given by the QLD law courts for feeding the dingos. I believe the $40,000 fine and the sentence you have been given have been incredibly punitive given the relatively minor ‘crime’ you have been charged with. The fact that your male companion received no criminal charges and a much lesser fine shows without doubt you are being targeted to be ‘made an example’ of. As the producer of Horse Talk TV – a national TV show on horses, I would like to add my voice the support for justice for you, for the fight to save the Frazer Island dingos, and for more humane management of the dingo population by the Department of Environment and Resource Management. The ‘hazing’ and shooting of the dingos by Park rangers seems to be ill thought out management procedure as the resulting starvation the dogs face by being unable to access their traditional feeding grounds by the sea shore seems to me to be a factor contributing to why the dingos are scavenging food from tourists in the first place. As an animal lover with a passion for horses I have been part of public protests to stop the horrendous aerial shooting in the name of ‘culling’ of Brumbies within Australian National Parks. Aerial shooting in NSW was banned eight years ago after images of horses being gunned down in Guy Fawkes River National Park sparked public anger. National Parks now work out trapping and re-locating strategies to manage wild horse herds. I hope public outcry as a result of Australia Story and other publicity will help you gainsupport for your fight for to save Frazer Island’s unique dingos population. Beautiful creatures. Shame about the authorities that want to ignore them to save tourism! There is a misconception that the Australian dingo is a species, when in fact it is a breed. The dingo is one of the oldest breeds in the world and the Fraser Island population is one of the purist in Australia but the Queensland Government has embarked on a policy that will ensure that the dingo is kept there in a state of starvation. As anyone knows, when a dog gets hungry it becomes less fearful and more likely to be aggressive in pursuit of food. So the policy of detaching the dingo from human beings has in fact backfired. The dingo (like any dog) also appears to crave human company. I submit that the Aboriginal people who are the original caretakers of the island and its wildlife should be permitted to take a more active role in caring for the island’s dingo population without excessive and unnecessary government interference. The present policy of culling starving animals is akin to a “concentration camp” mentality and seems more in line with a desire to gradually exterminate this wonderful breed. The policy is also extremely inhumane and reflects badly on the people of our country. Jennifer, I wanted to tell you how greatful I am that there are people like you who take a stand and look after the under dog. I have just watched your Australian Story on the ABC and am total alarmed, upset and angered by what I saw. Please keep going, I admire your drive and passion. Be loud, be their voice. What can I do to help? I can.t believe what you went through for feeding a dingo. Are the authorities there insane or what? Ther’s law for the guilty and law for the innocent and guess who always cops it, the innocent. Yet again, it has to do with money. They should all be shot. Animals were put on this earth for a reason, and that’s not to persecute people for feeding them. GET REAL YOU STUPID, DUMB AND HIGH AND MIGHTY LEGAL PEOPLE. What are you in that profession for?????????? To prosecute the innocent and give them a hefty fine and criminal record. GET REAL, GET OFF YOUR HIGH AND MIGHTY PEDESTAL AND BE FAIR WHERE FAIRNESS IS DUE. YOU’RE ALL NOTHING BUT DICKHEADS. Great coverage on Australian Story. I trust many were as outraged as I when seeing the plight of the dingos. I noted that changes had been mentioned with regards to tagging the pups which was a direct result of your information shared. Any animal will attack if starving in an effort to save itself and family. You should be congratulated on your detailed photography and observations instead of going to trial. If I kept my pets in a similar condition the RSPCA would be knocking on my door and I would be fined. How is that Fraser Island dingos can be treated in such a disgraceful manner. I will be looking to help – thanks for raising their profile. Tonight I watched with horror, “Australian Story” on ABC 1. The arrogance NPWS who are “supposed to protect the wildlife of this country” yet they allow the dingoes to starve, and have the audacity to prosecute, a person who feeds them. I can assure you that, from the date of the establishment of the National Parks & Wildlife Service (NPWS), on 1/10/1967, there have been a constant decrease of all our wildlife. We managed our wildlife a lot better, before they were established, and I have enough evidence to prove my statement. You should NOT feel guilty about feeding the starving dingoes. They (NPWS) should feel more than guilty, for allowing them, to starve. Even humans, ate other humans, when they were faced with starvation. Animals will only attack their enemies. That instinct is very strong, and that is why they were aggressive to the “little Hitlers” with the NPWS uniform. I believe Fraser Island should be made tourist free. The dingo is an Australian icon and are being hunted by humans. 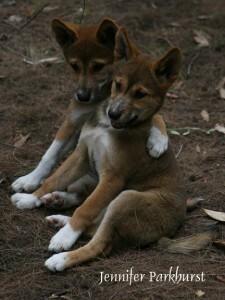 There the only pure bred dingos left yet Queensland Parks and Wildlife don’t want to save them? why can’t they release a new food source onto the island? like introduce rabbits. Make the island completely human free. maybe a researcher can go on to the island for a week every month to check on progress. It’s just like the scenario with the Tasmanian Tiger the last purebred one died in captivity, i hope the future is different for the Dingo. As for the accidents on the island with the children, don’t the parents have enough common sense not to leave them un-attended? I just watched Australian Story. It brought tears to my eyes. I cannot imagine how difficult it would have been to firstly watch those pups and beautiful dogs starve and die in front of your eyes, then to give in and help them only to be bullied and prosecuted by an unethical government department, and treated less favourably than someone else doing the exact same thing you did. This story broke my heart. I have never held interest in travelling anywhere in Australia – but I want to do what I can to help those poor dogs. We need legislative change – the dingos need protecting. You are such a strong woman to fight the government to protect yourself and those dogs. Keep up the fight – there are Australians from 1000s of kilometres away who support you and the dingoes you love. I am just watching the Australian Story episode which is still on as I write, and I am outraged !!!!!!!! Why have groups like WSPA/PETA not been brought in to take global action and create pressure on the NPW on Fraser Island ??????? If the Australian governemtn will not step up for these wonderful animals, then surely the next step is to enlist the support from outside the country ?????? I am just watching the Australian Story episode tonight, it’s still on as I’m typing this, and I am outraged that this is happening !!!!!! WHY IS THERE NO SUPPORT FROM GROUPS LIKE WSPA/PETA ???? If the Australian government is not taking humane, respectful and sufficient action to really support these wonderful animals, then surely it is the next step to bring in the pressure from outside, global animal welfare groups. Thank you for your interesting blog. You’ve clearly pieced the story together well. Mainstream media, cutting and pasting info from government media releases, is to blame for the misinformation that has been distributed. I did not ‘regularly’ feed dingoes during my time on Fraser Island. I spent 7 years on the island and I participated in the feeding of some of them by another person for roughly 6 months. The interfering charges are for simply ‘observing’ the pups at their natal den, with the permission of the alpha female dingo, and with an appropriate permit. I certainly did not feed those dingoes from the time they were pups. Those dingoes did not actually ‘attack’ other people. They did not ‘turn aggressive’. They were playful, boisterous juveniles and there was only one instance of them actually acting aggressive towards anyone and that person was a ranger. Four of them were destroyed for exhibiting ‘pack hunting techniques’. You can check this out yourself by applying for the information through FOI. Now, just so we are clear, FI dingoes are not hypercarnivores, and don’t pack hunt like mainland dingoes do. The prosecution/persecution was most certainly in retaliation of my criticism of the Govt’s management strategy, as can be seen by the penalties received this week (4-2-11) by two other ‘offenders’, one of which fed dingoes habitually for 30 years. I never used food to lure a dingo for a photograph. I never had to. That can be proven by the fact that my book, now published, features photos that were taken over three years ago, and the Govt certainly couldn’t find proof of me feeding them then, because I didn’t. I fed them because I was coerced (by a man who subsequently ‘dobbed me in’ out or retribution and revenge because I dumped him. Like the ranger who was caught feeding, this man made a deal with the government and walked away without any record and a mere $2,500 fine. ), and in the end, I agreed with that second party, that it would be intolerable to see yet another family group starve to death. ‘very serious attacks on two children’ is almost slanderous statement. One of the children was my god-daughter, who often came to observe the dingoes with me, and the dingo was trying to get her food and nipped her. It hurt, she was upset, but she later said that her family dog, a ridgeback, played with her more forcefully and bit her harder than the dingo had. The other attack – well there is nothing to substantiate that in any of the information available through FOI, except for ranger’s statements. It is well known that dingoes never lose their instinct to hunt, even if they have been in a captive situation all of their lives. The actual number of dingoes on FI according to the latest research is 20 breeding adults. Although DERM now states that ‘numbers are irrelevant – it is the condition of the dingoes that is important’. For shame that our native animals are being so badly dealt with – it shows a worrying ineptitude and lack of awareness and understanding. Intelligent people will fully support Jennifer in her efforts – unfortunately it’s not the intelligent people who are in charge! Once, decades ago, an essential part of every Australian child’s education and expected behaviour was kindness to animals. Where has this standard gone? Compassion for animals is a sign of an enlightened society. This present treatment of the dingoes is not worthy of a country once dedicated to the creation of a just and intelligent society. Must human greed, selfishness and unkindness infest every inch of Australia? dear jennifer, it saddens and but at the same time angers me that this is allowed to happen. there is evidence indicating that these beautiful dingoes are in trouble and need food urgently. what as humans have we become? we are our own worst enermies as humans. this so called ‘dingo management stregedy’ is clearly making things worse. how can the minister choose to ignore lives at stake. is it because they are not human? animals were on earth before we came along its about time we give them a fair go. how about if the minister traded places with the dingo and starved for a few weeks and see how it feel. maybe then she will wake up and see reality. you know as a animal lover and fighter for animals rights, it makes me sick to be a human knowing what pain and torture animals endure fo the sake of human satifaction. i am wanting to help anyway possible to stop this cruel act. Please save these sentient beings from starvation. No living creature deserves this treatment. It breaks my heart to hear of their plight! It is unbelievable that in this day and age ,with the knowledge we have , people can be so cruel, uncaring and shortsighted as to allow the suffering of the dingoes on Fraser Island. We have had several young Canadians stay with us and one of their priorities is to visit the island to see a dingo. Politicians should be the ‘endangered’ species.